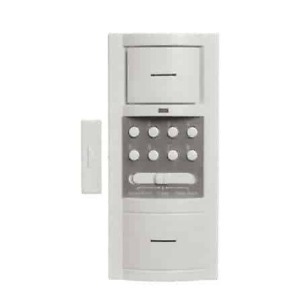 Easily mount this self-contained motion sensor/alarm next to an area you want to monitor. When motion is detected, this unit will announce with a chime or loud alarm. Cut off alarm with convenient keypad. Motion Detectors are an easy and effective way to improve your home security. We have many different systems that will meet every home or office security need. Motion detectors can also be used as door chime entrance alerts to announce visitors or customers to improve your professionalism and customer service. Keep yourself informed and have peace of mind knowing that your property is protected. Great for small shops, offices, homes! Use either chime alert or siren. 80db chime for normal everyday use. Detects intruders and sounds built-in alarm. Or automatically announces customers/visitors with chime sound. Mount on wall or place anywhere in a room, set chime/alarm switch, and then enter code to arm unit. Detects motion up to 40 feet away within a 110 degree area. Portable or wall mount – no wiring needed, great for travel. Changeable code for added security. Total Security! And only you know the code. Like professional systems, this unit uses a changeable code to arm and disarm the alarm. You and others you trust know the numbers – no one else. Entrance chime alerts you to visitors in small shops, offices. Alarm operates on three AA batteries (not included). No wiring needed. Secured battery compartment for added safety. Free-standing on table or shelf, or mounts on wall in minutes. Portable – Great for travel. 30-second exit and 10 second entry delays.